24th of May – is the day of the Bulgarian literacy and Slavonic script. 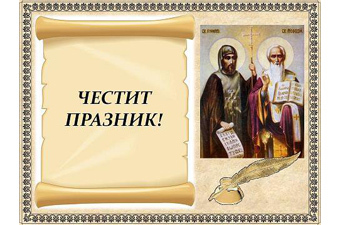 On this day commemorates the creation of the Glagolitic alphabet of Cyril and Methodius. 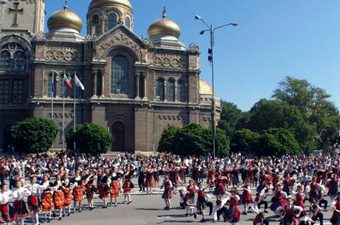 In Bulgaria, the holiday is celebrated with parades and concerts. In the capital festive procession attended by the President, and also announced free entrance to all museums in the capital. Festive procession continues to the monument to Saints Cyril and Methodius, to which will be laid flowers and wreaths. In “St. Alexander Nevski” will be performed a holiday public prayer of Bulgarian Patriarch and Sofia Metropolitan Neophit. In Burgas festive procession will be launched from the Sea Garden and will reach municipal building. In the parade will join many students and teachers. In Plovdiv, the procession will be square “Central”. In Yambol parade will start from the two main schools and will end in front of Yambol. In Blagoevgrad celebration will start at the National Humanitarian High School. Celebration there is also a celebration of the city. 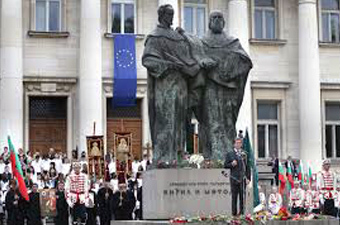 The monument to the brothers Cyril and Methodius will be laid wreaths and flowers. Parade will end at the central square “George Izmirliev” which will be organized a concert. Varna processions are held in the center of the city – the Cathedral, the town hall and main square. It will pass through the main boulevards, and will end at the entrance of the Sea Garden. In addition, there will be a parade of sailing the letters. Aboard the yacht in the sea will be released 30 colored balloons, colored in white, green and red. The parade will be attended by students from many schools. In the city of roses – Kazanlak festival will be celebrated with solemn festive processions in the city center.